‘ㄴ’자로 맞붙어있는 거울과 나무판은 전시장 벽 하단부에 부착되어 있다. 다이빙보드처럼 앞으로 돌출된 나무판은 거울 속에 투영되어 대칭 이미지를 갖는다. 드러내는 동시에 이에 비해 즉물적이고 사소한 현실을 하나의 나무판과 나무판 이미지로 시각화했다. ‘끝‘은 현실과 맞닿아 있지만 결코 다다를 수 없는 미스터리이다. 작품 앞에 선 관람자는 거울을 통해 나무판뿐만 아니라 바닥을 딛고 서있는 자신의 발 또한 보게 된다. 우리가 서있는 곳은 결국 우리가 되돌아갈, 삶이 끝나는 곳이기도 하다. 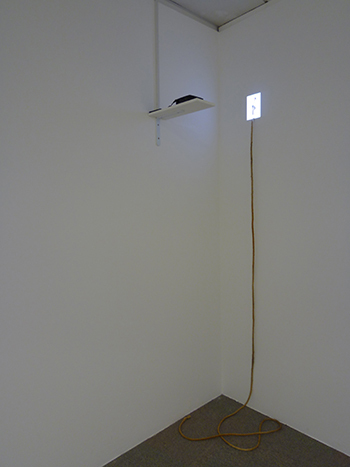 A mirror hangs low on a gallery wall, a wooden board protruding perpendicularly from its lower end. while the other exists as an image in the looking glass and remains out of our reach. 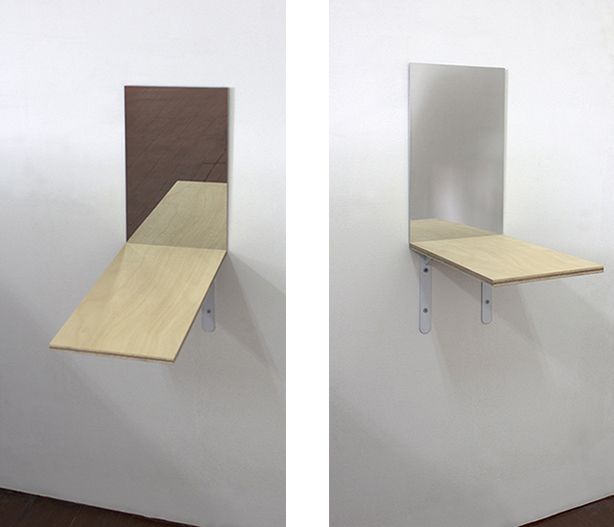 simultaneously visualizing a material and trivial reality through the wooden board and its reflection. Ends are connected to reality yet remain out of bounds. 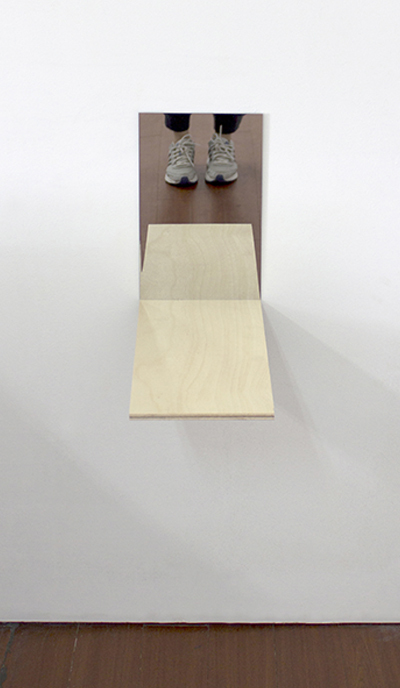 wooden board — where we stand is ultimately where we shall return, where our lives will reach their end. 프로젝터를 통해 투사된 사람은 실제 밧줄을 두고 줄다리기를 하고 있다. 인간의 존재는 불빛과도 같다. 여러가지 행동을 취하며 무언가와 대항하지만 그 영향력은 한낱 반짝이는 빛처럼 약하다. 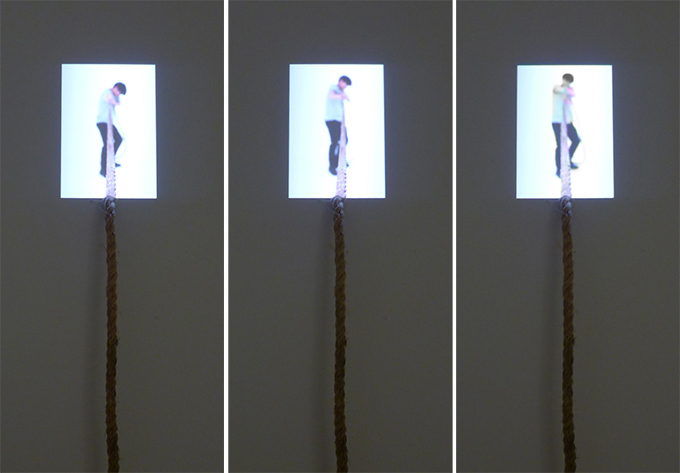 The digital projection of a man tugs a rope that exists in reality. with little effect, creating gesture with the rope but unable to move it? 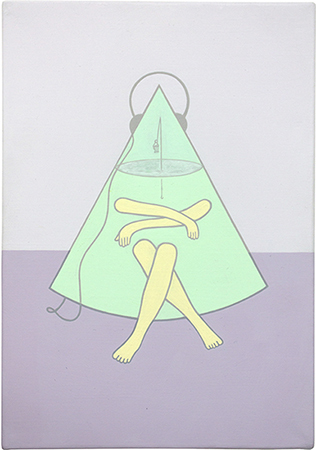 The work examines the sense of futility in work and life.